Plenty of Christmas parades and other special events recently have taken place … and will take place in the coming days. And let’s not forget all the New Year’s Day festivities just around the corner. Yes, there’ll be plenty of holiday activity on the streets of Southern California. Which means there’ll also be road closures in certain areas in order to maintain traffic control. If your district requires such a closure, for the holidays or any time, consider Roadway Construction Service for the task. Backed by years of experience, we can handle virtually any kind of road closure request. Short distance, long distance, multiple lanes, single lane. It doesn’t matter to us. We’re deep with resources and ready anything. When dealing with temporary lane closures or long-term road closures requiring road barriers, particularly during the festive and crowded holiday season, we never generalize. Every situation is unique. 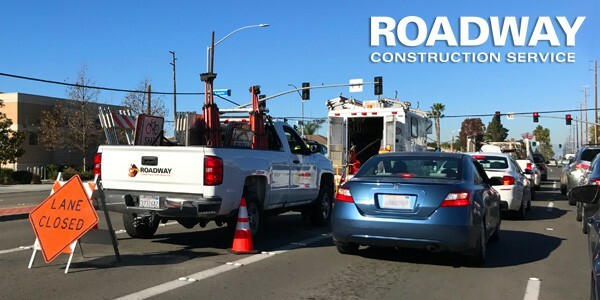 Roadway Construction Service looks long and hard at every street, every sidewalk, every building, and every other physical variable that comes into play. Once the situation is fully examined, our expert team formulates an air tight traffic control plan. All issues are addressed; all contingencies are covered. If a mouse might cross the road at a given interval, we’ll know about it. And we’ll incorporate this and every other factor into rock-solid strategy. When implementing a road closure strategy, Roadway Construction Service takes a multi-dimensional approach. The first dimension encompasses the full range of traffic control barriers, including water filled k rail, applicable to a given project. Thanks to intensive planning, our team develops a traffic barricade configuration ideally suited to each closure. Traffic cones represent the most basic element in our lineup of barricades. These typically see duty when both maximum visibility and maximum portability are required. Easy to lift-easy to see are the twin advantages of traffic cones. Holiday parades and other special events often require the closure of multiple lanes. As a rule, this requirement demands the most intensive measures. Something strong and solid is must. 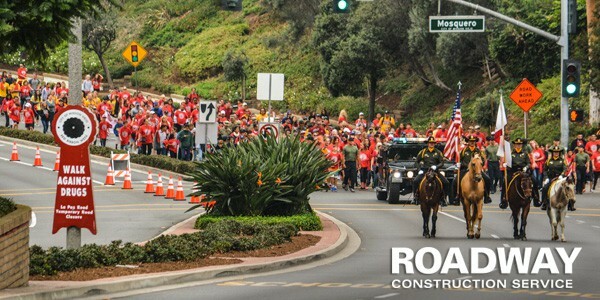 For this need, Roadway Construction service deploys the largest traffic barricades in its lineup – k-rail — or as it is sometimes called, Jersey barrier. We can choose from two types of k-rail. Since road closures for special events are temporary, we typically deploy water-filled Jersey wall for such tasks. Made of a rigid but hollow plastic shell, this component is easily assembled, moved, and disassembled. Within the shell is a hollow water compartment that readily can be filled or emptied, as needed. For long-term road closures, we employ concrete k-rail. As can be guessed, this type of barrier gets its strength from its solid, concrete composition. When it comes to keeping unauthorized traffic out of restricted areas, nothing beats this barrier. Perfectly complementing this lineup of traffic barriers is our team of traffic control flaggers. Trained to perfection, these experts are qualified by the industry’s highest certifications. This includes the prestigious certification awarded by OSHA. Because of their training and experience, our traffic control flaggers consistently maintain orderly traffic flow when overseeing road closures. More importantly, they maximize safety and minimize hazards in these areas, proving themselves invaluable assets in every road closure strategy we implement.